The acoustic guitar market is already filled with a variety of brands offering what they claim to be “the best”, and they all come in different shapes and sizes at different price points. The options are endless, making hunting for the right acoustic guitar so much harder than even. In the junior dreadnought category, though, there are only a few names that immediately come to mind when talking about “the best”. The Martin Dreadnought Junior (DJR) is one of them. Critics and pro users alike agree that this beauty could go down as one the best acoustic-electric guitars in the market. But it does not come cheap. Today, we are looking at the Martin DJR, how good it really is, and how worthy it is for every kind of user. The Martin DJR is a scaled version of a full-size Martin dreadnought guitar, like the DRS2. 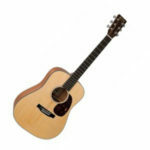 It is designed for people who want a smaller, thinner, lighter, and cheaper Martin acoustic-electric guitar that retains the solid wood build. On top of the all solid wood construction is a proper mortise and tenon neck joint, soundhole rings, and a bound top edge. The internal X bracing and struts are also done in the classic Martin way. The headstock is scaled down with standard smaller tuners. Despite being a dreadnought junior, this guitar has a full-size nut width and string spacing. From the looks of it, pretty much everything about the Martin DJR adapts the original Martin style. Not until you will notice the fingerboard and bridge, which are made of a more expensive synthetic ebony Richlite. The neck, too, looks like an expensive piece of mahogany but it is just a select hardwood. 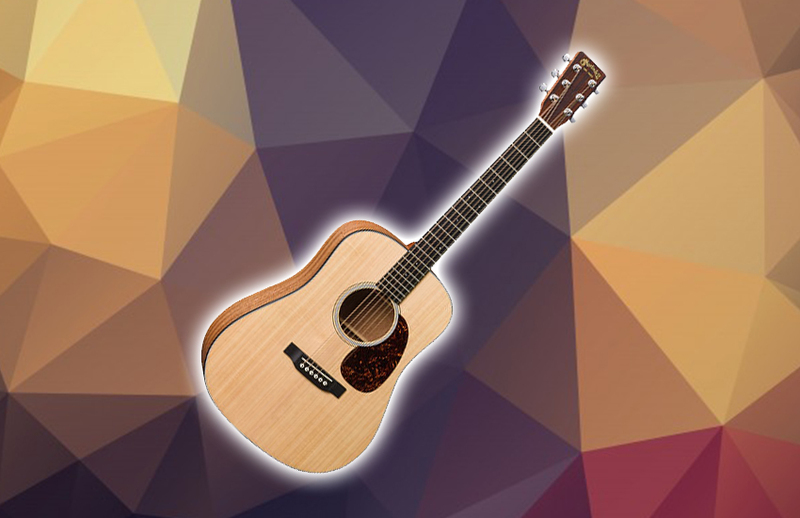 The hand-rubbed natural oil finish accentuates this acoustic-electric guitar’s overall look. It made this beast a really good-looking guitar. On the flip side, the natural oil finish would not protect the surface of the guitar the same way that a satin or gloss finish would. In addition, natural oil requires maintenance. The Martin DJR looks a lot like a pure acoustic guitar, but it is not. The soundhole-placed volume, tone controls, and the battery bag on the neck are the only dead giveaway. 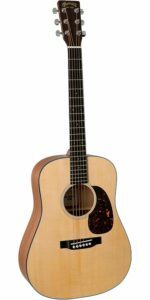 If compared to full-size Martin dreadnoughts, you will only see and feel the difference–it is less cumbersome and really convenient to play with. In terms of sound, the Martin DJR does not have the huge depth and width of the full-size dreadnought harmony-wise. However, it has a punchy midrange and a slightly textured edge. When plugged in, you get enhanced trebles, but this is something you can adjust on an outboard equalizer. The Verdict: Should You Buy Martin DJR? For beginners who want to take this craft seriously, the Martin Dreadnought Junior is a great entry to the would of acoustic guitars. Not to mention the original Martin heritage that you will experience. Although, you need to consider the price tag as well as this is not beginner-friendly at all. But if you have some cash to burn, this acoustic-electric guitar is a great investment. Compact and sturdy build and great sound — that is not too bad.